Even on the moors, at 440 metres above sea level, many archaeological sites can be seen, several previously unrecorded. I will list my recent discoveries in this blog. Most sites have been subsequently confirmed by other archaeologists and a geologist. Certainly much work needs to be done and detailed survey is urgently needed. 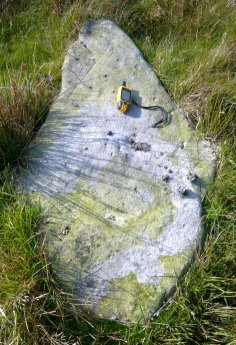 Detailed photographic survey of a site on Rooley Moor completed and magnetometer survey of another site (TBA) undertaken. Watch this blog for more details! Great grass covered burial mound, near Rooley Moor, also missed amazingly. The site below was missed in an earlier archaeological survey (oops!) and is man made and not a quarry or a mine, according to a British Geological Survey Geologist who kindly visited the site. Why not a quarry? not local stone! 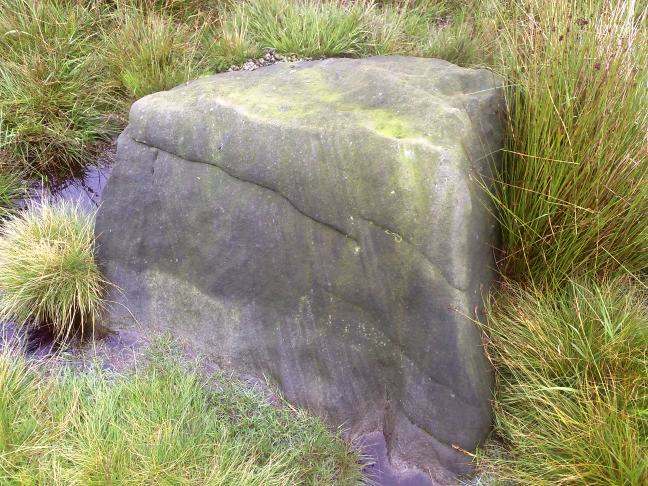 If the stones were quarried on the spot they would be “Haslingden Flags”. The number and orientation of the stones cannot be explained by glaciation. The difference in vegetation, visible in the photograph, may be why this area was chosen by whoever built this damaged, enigmatic site. Clear signs of working, note the two notches at the base of the stone. 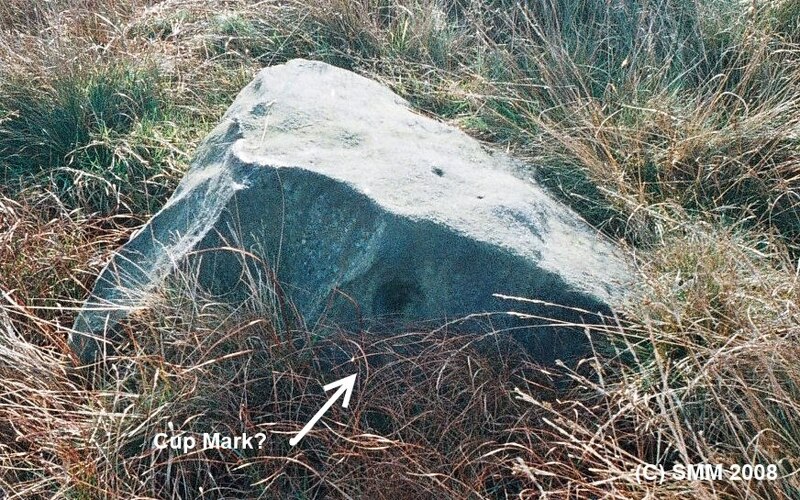 This stone is clearly not from the immediate vicinity and so cannot be the result of quarrying at this location. Here is another to the SW. Still visible after thousands of years, the Bronze Age cairn (burial mound) at Bagden Hillocks. The area of the cairn is marked by the greener vegetation, the pile of stones in the centre is more recent. Thanks to Bury Archaeology Group and Whitworth Historical Society regarding this cairn. Close to Bagden Hillocks cairn another damaged mound can be seen. Watch this Rooley Moor archaeology video! Here is an example of Lidar revealing archaeological sites as in this rectangular (enclosure?) on the western edge of Rooley Moor. If you explore around this area you can see many ditches and other features I have mentioned earlier: they are clearly highlighted by the Lidar image. Lidar used to be exotic and expensive, but no longer! Cutting edge, archaeological aerial survey techniques are now free for us to use. Smallshaw, note the three ditches of the prehistoric enclosure and the image “shows” the ground under the tree cover! Here is a standard aerial view. The link example directs to OS grid reference SD 81, which covers most of west Rochdale. See more about the OS grid reference system here. Select a grid reference by entering the OS grid or move the map with your mouse or by touch. Enter SD81 to select the grid that covers west Rochdale. Select the grid you are interested in (SD81 in our example). Select DSM (in this example) at 1m resolution for SD81. The files are a zip archive of 180.3MB! Select the green download icon to download the zip archive. You directory, with the unzipped files should look like these names, they are ASC file format. These ASC files have to be converted into images you can view, use a GIS system if you have access to one (lucky you! ), if not…go to step 11. To decode ASC files without a GIS system download the Relief Visualization Toolbox (RVT) for your operating system (currently supports Windows and Linux 64 ) from the Research Centre of the Slovenian Academy of Sciences and Arts. Download the RVT (for example rvt_1.1_win64 for Windows 7) and then unzip the files to a directory. Select add the ASC files in your directory (SD81 in our example). Load all the files and use the default settings for now and then select “Start”. This will take time depending on the speed of your computer. When the process is complete your directory should now have graphic files (TIFF format) created alongside the .ASC files. View these files with any program that can read and display the TIFF images, I used a free program called IrfanView. Here is a selection from one of the images, know what is in the centre? send me a message if you do please! -:) it’s old and it is north of Bury! Want to install your own GIS system? Try this site, just zoom in to explore your region (some areas do not have Lidar coverage). Note you do not have the choice of surface or terrain Lidar images. Special thanks to Marcus Jecock of Historic England for telling me about the Lidar source files and the software to decode the ASC files. The software to decode the Lidar source files is from Slovenia’s Institute of Anthropological and Spatial Studies and is funded by the EU, see more details here. James Moran-Zietek for telling me about LandSerf. Looking south towards Man Road Ditch and Knowl Hill, Photo by David Mercer. Even the name is mystery, “Man Road Ditch”. The ditch is of unknown date and unknown purpose and runs from the foot of Knowl Hill in a NNW direction. The earliest reference found so far, is in the first series 6″ OS map (1851) of the area. See the aerial view of the ditch here. Note select “satellite” to see an aerial photograph of the ditch. The feature that crosses it at the bottom of the image is the turbine access road! Man Road Ditch, being damaged by an access road. There were three castle place-names mentioned in the 1626 Rochdale Manor Survey, but I found the site before I knew of the reference to it. We commissioned a geophysical survey and Al Oswald of English Heritage identified a strip lynchet on one of the site’s steep slopes (west facing). It was not actually in Rochdale, it is in what was the old parish of….Middleton, in Ashworth township. Select “Satellite” to see an aerial view instead of the map. 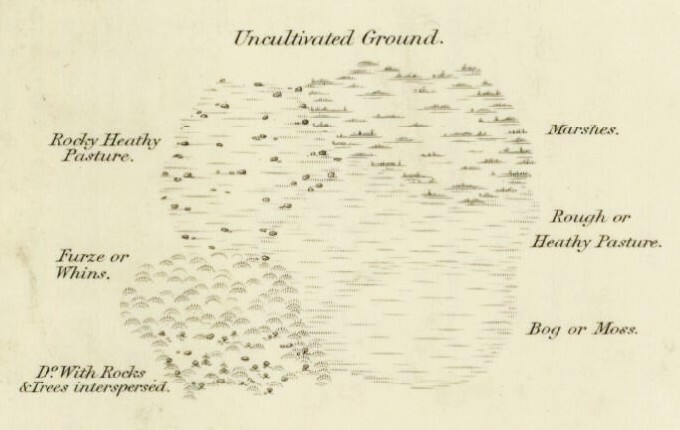 This post will briefly cover the historical background to the area, (including the Forest of Rossendale) to better understand the context of the many archaeological sites in and around Scout Moor. There are some exciting newly discovered sites to reveal. As in the case of the adjacent Rooley Moor, the area has never had a thorough archaeological survey, perhaps that is an understatement. Select one of the links below to see sites of Farmsteads Fecit Lane and Coal Road: (centered on SD 81852 17717). To the North of these on Higher Hill (This site is not on any OS maps as far as I know). The feature is best viewed with Microsoft Bing Maps birds eye view. See the sites in Fecit Lane and Coal Rd. as they were in 1851 (surveyed 1844 to 1848) on and old OS map of Lancashire LXXX. Wind farm road cuts ancient ditch called Man Road Ditch, of unknown date or purpose. The extensive body of medieval documentation for the area has been largely ignored by archaeological surveys of the area. This has been covered here. There was a vaccary (medieval cattle ranch) somewhere in Cowpe, location not yet verified. Scout Moor lies mostly in what was the NW of Spotland, a township in the parish of Rochdale, and in what was Bury Parish. These are the historical areas (which were all in Lancashire), modern boundaries are very different; with the area now divided between Greater Manchester and Lancashire (Rossendale district). Researching the geological context for your archaeological survey is essential. What processes (glaciation fault lines) led to the landscape you are exploring, how did this influence settlement patterns? Were mineral deposits (such as coal or iron ore) or quarry stone used in the area/period you are researching? How did soil formation effect (light soils sandy soils easier to plough ) land use? How drainage/hydrology effect farming/fishing and transport routes. Will the surface geology effect geophysical survey surveys? A ‘game changer’, we are going to use a quadcopter to photograph existing, and reveal new medieval and earlier archaeological sites! Jeff will be our pilot! He has already delivered outstanding views that show sites in a whole new light! Get a base map of 1st series OS maps, National Library of Scotland have a fine site for this purpose. Check for any old sites that are recorded but never photographed. Use previously published criteria to locate special areas of interest. Often called “quadcopters” if they have four motors, the most common format for affordable flying. TBS Discovery used by guess who?! Quadcopters shop in UK – I have no connection with them, so for information only! Thanks to Jeff we have made significant discoveries, more soon! Great site for old OS(Ordnance Survey) maps of the UK, including detailed maps of Lancashire, here. County Series 6 inch / 1:10,560 – 1842-1952.